Image courtesy of davidmelloruk via Instagram. It’s coming up to that time of year again. Primary School children are dressed as various woodland animals whilst belting out The Servant King with all their might. Harassed relatives are torn between novelty chocolate shaped figures for family members. My Mum stares longingly at the strawberries and cream Lindor egg, whilst loudly professing that she doesn’t need one this year. Yes, it’s Easter. However, it’s never truly Easter without a little on the fly baking. Often with disastrous results. 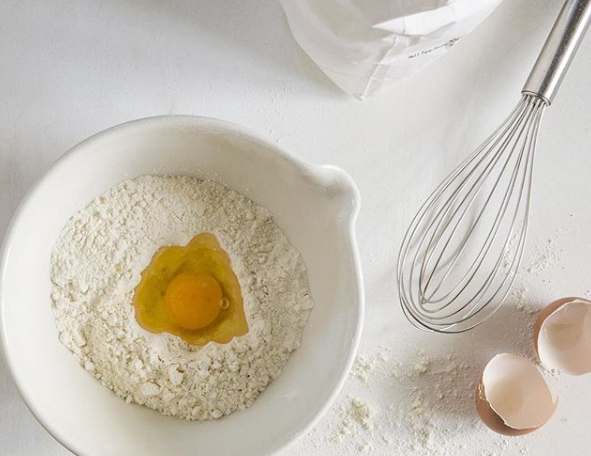 It’s that season when kitchen novices whip out their whisks, their cookbooks that have been gathering dust on their shelves since ’98, and attempt to make some culinary magic. I’m here to save you the trouble (and the dust inhalation). I’ve compiled a whole bunch of simple but scrumptious Easter treats that are bound to put smiles on everyone’s faces. Even the most calamitous cooks should be able to manage these. It’s a kid’s classic, but why let them have all of the fun? 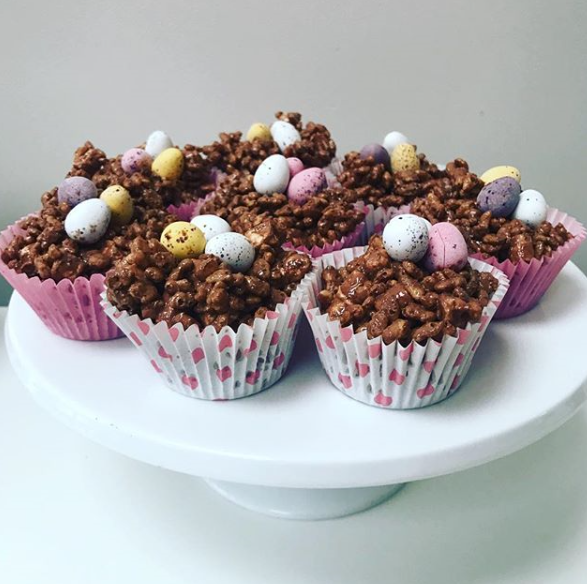 Here’s how to make your own delicious Easter Nests. Image courtesy of instahome37 via Instagram. 90g Good quality dark chocolate. Two bags of mini eggs. Quarter-fill a medium sized saucepan with water, and gently heat it until it begins to simmer. Then place a glass bowl over the top, full of your milk and dark chocolate. Both broken into little pieces. Keep stirring this gently, combining the two chocolates as they melt. Once melted, remove from the heat. Add your cereal of choice, mixing it thoroughly until all the cereal is coated in chocolate. Spoon this mixture out into the cupcake cases. There should be twelve in total. Add two or three mini eggs to each one, giving the nests some eggs. Then pop your little chick figures on top, being careful not to accidentally cover them with chocolate. Leave them on the worktop to cool, and then pop the in the fridge. Once they’ve cooled down and solidified, take them out of the fridge and enjoy! Image courtesy of craftybakernz via Instagram. I was met with a unanimous gasp from most of Costa when I revealed that I had never eaten a hot cross bun. Thankfully, I could remedy myself with this tasty recipe. Pop your flour into a large bowl, then stir in the spices, salt and sugar. Tip in your dried fruits and your yeast; mix in so that they are fairly evenly distributed. Warm up your milk, then mix with the eggs, beating until smooth. Pour over the dry ingredients. Mix the ingredients gently until they become a moist dough. Leave it for 5-10 minutes, before taking out of the bowl and cutting into 8 (equal) pieces. On a floured surface, mould the dough pieces into rounded buns. Pop these on a baking tray lined with greaseproof paper. Cover the buns with clingfilm and leave them in a warm place to rise for an hour. Heat the oven to 220oC/200oC fan/gas mark 7. Mix the plain flour with 2 or 3 tbsp water to make a thick paste. Pour this into either an icing bag if you have one, or a plastic food-bag and chop the corner off. Bake for 15 minutes until fully risen and a golden colour. Gently heat 2 tbsp apricot jam, before brushing lightly over the buns. Eat! These are just plain fun! They look great, they taste great. 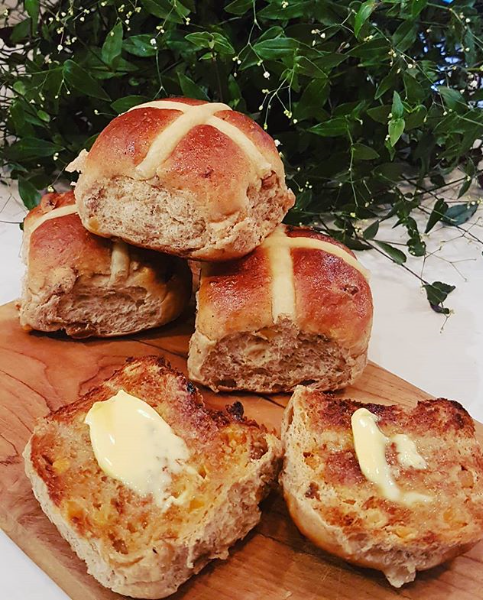 The recipe was inspired by Cassie Best’s Easter Biscuits. Cut the butter up into small pieces before popping into a large bowl with the sugar and vanilla extract. Cream the butter and the sugar with a spoon, or an electric whisk. Add the egg, gently stirring it into the creamed butter and sugar mixture. Then add the lemon zest and slowly sieve in the flour. Use your hands to mould this all together into a ball of firm dough. Let this chill for half an hour. Heat the oven to 180oC/160oC fan/gas mark 4. Roll out the dough onto a floured worktop until roughly the thickness of a £1.00 coin. Using either an egg-shaped cookie cutter, or an oval cardboard stencil, cut out 18 egg-shaped biscuits. Regather and reroll any offcuts to make more. On half of the biscuits, cut out a small circle near to the bottom of the biscuit, where the yolk would go. Pop on two baking trays lined with greaseproof paper. Bake for 6-10 minutes until golden brown. Then let them cool for 15 minutes until completely cold. Coat one side of the biscuits without the holes in liberally with lemon curd. Generously dust one side of the biscuits with holes in with icing sugar. Stick the sugary biscuits on top of the ones coated in lemon curd. They should now look like eggs! Next articlePoetic post-punk: REVIEW -'Dogrel' by Fontaines D.C.